Nglanggeran Mountain is an ancient volcano about 60 million years old located in the region Baturagung, the northern part of Gunung Kidul Regency at an altitude of about 200-700 masl. District Nglanggeran Teletak village peck, these sights can be reached about 15 minutes or about 22 km from the city Wonosari. This area is an area that litologinya allegedly prepared by the old volcanic material and has a beautiful natural landscape that is geologically unique and of high scientific value. Based on the results of numerous studies and references, Nglanggeran mountain is an ancient volcano, the presence long before the formation of Mount Merapi in Sleman district. Climbing Mount Nglanggeran, you will encounter sebauh Joglo building (Hall Joglo Kalisong) at the entrance, and there will be three simple view of the substation building heights low, moderate until the mountaintop. From the top of the mountain, the view widely spread out like a green carpet. When we look down, we could see the fields, gardens, and buildings tower and various television stations whose numbers quite a lot, manambah natural beauty. Nglanggeran name reputedly comes from the word meaningful planggaran every evil behavior must be caught. There is also a telling, a berketinggian hill 700 meters above sea level with this durable word meaning safe and peaceful village. In addition to such designation, the mountain is composed of many stones are known by the name of Mount Wayang because there is a mountain / rock that resembles the puppet characters. 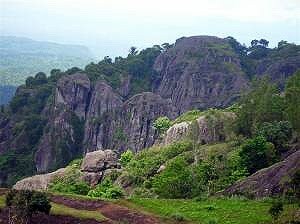 According to traditional belief java Mount Nglanggeran guarded by Wijaya and Punakawan Ongko Kyi. Punakawan in these puppet characters, namely Semar, Gareng, Petruk and Bagong.